When you’re pedalling around town between meetings, a brunch, lunch or drinkie, it’s hard to work out what to wear, especially when it comes to your jacket. More often than not I find myself grabbing an old denim jacket, which is admittedly a classic in the style stakes, but it's a piece that fails spectacularly when it hammers it down. My other option is to squeeze a performance jacket over my civvies, which often makes me look like a bulging Michelin Woman. Not good. Offering performance features plus a stylish cut, could the new Rapha Hooded Rain Jacket be the answer? 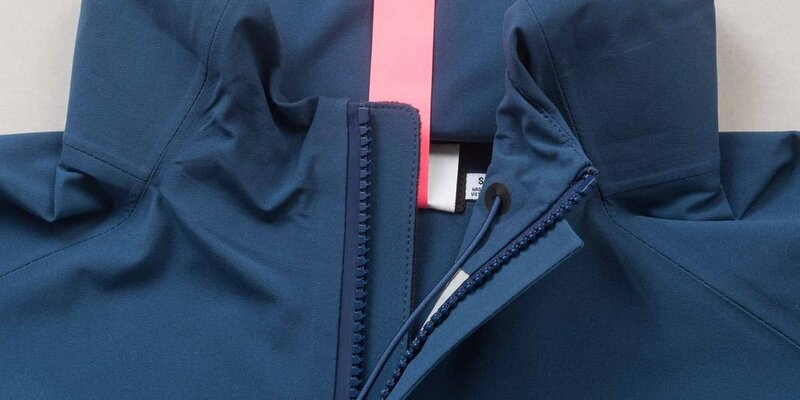 When I first get my hands on the Rapha Hooded Rain Jacket, I’m instantly taken with the dark blue colour, which easily pairs with most outfits. The lightweight material certainly lives up to the high quality you’d expect from a Rapha piece and it’s nice to see those signature Rapha flashes of pink detail aren’t too overbearing. A first try on reveals just how lightweight the jacket is and the feel is great: the nylon material is soft against the skin and, even when fully zipped up, there isn’t any rubbing around the neck. The pink tail flap (for essential protection from rear-wheel back spray) can be easily folded away with a snap of a button, and the roll-back, high-visibility cuffs are a nice touch for additional visibility. On this point, I think more could be done to integrate high visibility material into the overall design, but I guess that’s the compromise you make when coming up with an urban rider’s jacket for roaming and riding. 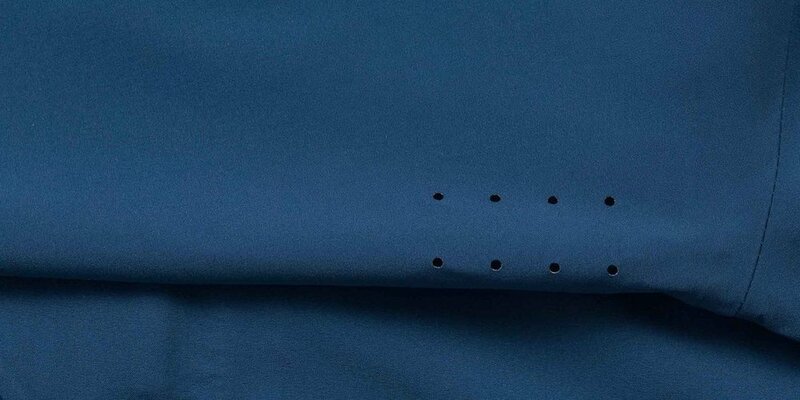 There are certain details I was attracted to straight away, like the velcro-fastened placket which hides away the zip. When I test this on a quick jaunt to Sunday lunch with friends (roast chicken with stuffing, cauliflower cheese, chipolatas and all the trimmings), I discover that it’s easy to pull open, even with gloves on, and the chunky teeth of the zip make for easy zipping and unzipping. The two-way zip fastening also gives you the option of being able to unzip from the bottom if more ventilation is required. It’s geeky, but these are the kinds of details that make all the difference to comfort on the bike when you're adjusting to suit our ever-changing weather. Talking of weather, if cruising around town and a torrential downpour takes you by surprise, Rapha have planned ahead by featuring a hood that has been specifically designed to fit under a helmet that features toggles that can be easily adjusted with one hand. It's snug in there, but you are saved from a serious head soaking. The good news is that the lazer-cut holes under the arms do a great job with ventilation, and unzipping the jacket when I got warmer during riding also felt comfortable. Surprisingly, the hood didn’t feel overly cumbersome around the neck either. When it comes to gale force winds and rain, the windproof material means you feel protected, especially with the taped seams. The overall fit while riding is great and the high-stretch fabric means the jacket stretches with you when you’re down on the drops, for example. The jacket doesn’t have rear pockets like traditional cycling jackets and this is both good and bad. If you do want to use it for longer distances, then you’ll miss those easily accessible rear pockets for snacks. However, urban dwellers / commuters can be reassured by the front pockets, which are more than ample for your storage / snack needs. Well, that and the fact there seems to be a Pret on every street these days. One caveat. This isn’t a fully waterproof jacket, so if it’s absolutely tipping it down, do expect leakage. Having worn this jacket on many long and short rides through December and January, I’ve grown very fond of it. The material is exceptional when it comes to keeping the wind and rain off when the elements are gnarly, while great ventilation means you are sorted on those blessed milder days, too. All in all, it’s a great jacket that will transition effortlessly from bike to brunch / bar / bellydancing class and makes an excellent purchase for anyone who spends most their life on two wheels. It’s also fantastic for compliments per wear, with many of my non-cycling friends giving it the “nice jacket” nod. Win!